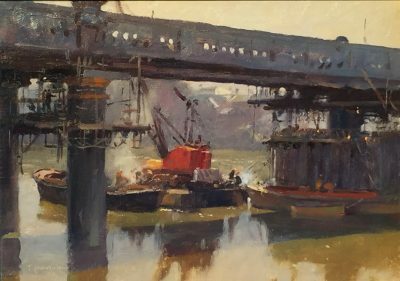 Born in London, Peter studied at Hammersmith School of Art 1935-1938 & 1947-1950 and at the London Institute of Education 1951 & 1971. He was awarded the Art Teachers Diploma an Ac. Dip in Education. 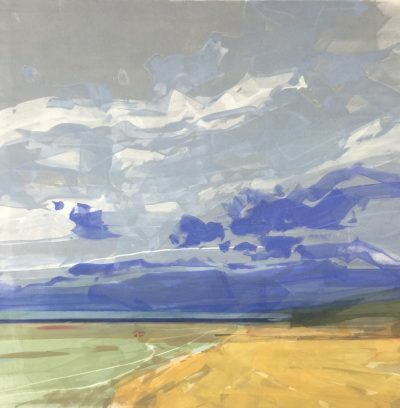 He taught art at West Norwood School and became Head of Art at Plaistow Grammar School as well as teaching at Fulham and South Kensington Adult Education Institute. He retired in 1979 and moved from London to Dorset. His painting 1949-1979 was of London, with particular emphasis on children playing and the textures of London’s buildings (see pictures 1 & 2). 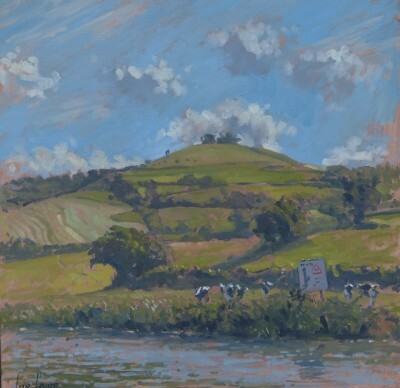 Once retired he became interested in the Dorset landscapes painting many winter and summer scenes featuring hunting and agricultural themes (see pictures 3 & 4). He also paints still life pictures, exhibiting in various London galleries. Compared to his other work these are typically smaller in size and are usually of fruits and vegetables (see pictures 5 & 6). A personal interest of Peter’s has been religious imagery of the 14th & 15th century viz. Fra Angelico and the Wilton Diptych. His own work inspired by these styles have never been exhibited or shown to date.